The omnipresent symbol and global icon, Ganesha, celebrates his birthday today. 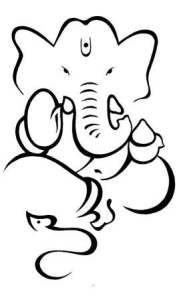 To many Ganesha is a Indian/Hindu deity and to some others, like some of my friends in Germany, an Indian restaurant! While many find his pot belly and elephant face a disconcerting symbol of divinity, those who know the story of how he came to be and what his physical features represent, see the meaning behind it. Irrespective of our pet feelings and perceptions about this divine form, there is no denying the fact that Ganesha is a global deity and an international icon – a status and recognition that many companies pump millions of dollars to bring to their brand! Of course, divinity cannot be compared to a corporate brand with commercial interests. But there are two things that strike me about brand Ganesha, that is relevant to any global brand. It is exactly these two aspects combined with his human-animal form that make Ganesha memorable, even for people of different faiths. 1. Visual representation of a brand has a greater power to communicate with a global audience when compared to text/words. Words and texts can be interpreted differently in different contexts and languages, but an image can communicate a bigger picture, without being rigid or limited like words and languages. The elephant face mounted atop a pot bellied human figure gives Ganesha that distinct, unequaled visual – a uniqueness that could not have been brought by words strung together. 2. Although Ganesha is thought of as a Indian God, in reality he has a global following – Malabar to Morocco from Southeast Asia to Mexico, to South America to South Africa. Yes! And to please his followers in different parts of the world and from different cultures, this global God wears a local attire (clothes and accessories typical of that region) to connect with each of them. (Think Global, Act Local…does that ring a bell?). In Central America and Mexico Ganesha is apparently dressed in Aztec clothes. In Iran he takes on Zoroastrian robes. In Thailand he is seen holding local plants and herbs in his hands and I believe in Nepal he assumes a Tantric look. How cool and clever, eh? I was awe struck to see his image in one of the Indonesian currency notes.